Flexing its flower power, the town was awarded gold in the Town/City Centre and Business Improvement District (BID) categories as well as a top honour for best Business Improvement District. It’s the third year in a row that the town has clinched one of the prestigious awards and added to its trophy cabinet. This time, the judges from the Royal Horticultural Society visited at an extremely busy time for the council’s team of town centre gardeners, who were battling record temperatures to keep the town looking its floral best. Their efforts didn’t go unmissed by the judging panel or Councillor Phil Riley, Blackburn with Darwen Borough Council’s Executive Member for Regeneration and Growth. It’s terrific that Blackburn has won a hat trick of top awards at Britain in Bloom and been recognised for the third year in a row. 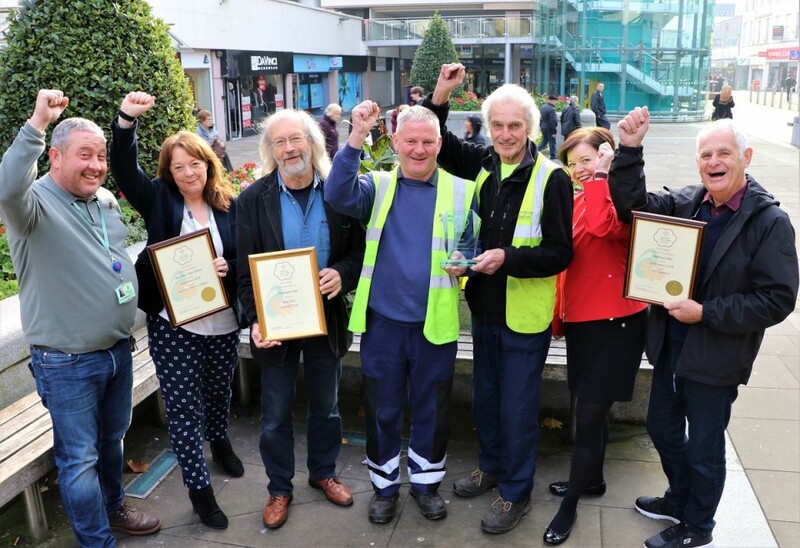 This is testament to the hard work of the council’s team of town centre gardeners and those at the BID – all of whom work tirelessly to make sure Blackburn town centre is a fantastic place to live, work, visit and shop. Our talented gardeners were particularly up against it this year as the temperatures soared over the summer months and it became a constant battle to keep everything watered and in full bloom. They all worked incredibly hard though and these awards are very much deserved. The town has undergone a massive transformation of late with regeneration still on-going right across Blackburn. Awards like these are a fantastic boost for the whole town and I’d again like to congratulate everyone involved. Members of Blackburn’s BID help fund additional floral displays for the town and pay for their up-keep. And, the competition’s judges were impressed by the businesses’ involvement in helping to make the town greener and cleaner with the additional planters as well as volunteer clean-up initiatives. To be recognised three years in a row is a fantastic achievement for the town. Working in partnership with the Council’s dedicated gardeners, our businesses and volunteers has shown what can be achieved. We are incredibly proud. 2018 was a challenging year for the teams in the town centre due to the heat and lack of rain and to attain such standards again is outstanding.